Four of the six cantatas in this volume are written for soprano, treble recorder and basso continuo. The use of the treble recorder can be explained on the one hand by the general popularity of the instrument in that period, on the other hand by the fact that James Duke of Chandos (to whom this volume was dedicated) himself played the recorder. 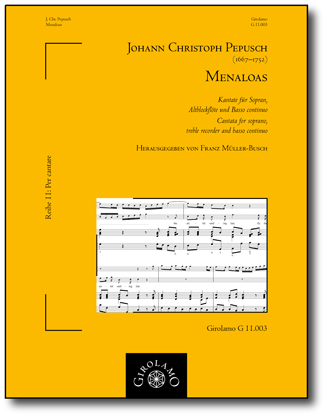 The cantata Menaloas is based on a text by a certain Mr. Gee (G.?). the soft deluding ways of love. Fly, fly the artful smiling fair. forgot the long experienc’d truth. who thus insults her trembling prize. from mighty Love is no defence. soft Beauties ever Conqu’ring Chain.